WYSIWYG: What you see is what you get- Here, you can visualize what the result will be as you type in. YSIWYM: What you see is what you mean- This is another way where markup of the document is done before and the content is added later. Before we begin with the list of best free LaTex editor for Mac and Windows, let me explain you in brief what these exactly are. LaTex editor is basically a markup level tool for editing where content entry and word formatting can be separated. This is pretty similar to what format is used in HTLM. LaTex is one of the most commonly use editor and those who have to deal with a lot of mathematical equations and other such scientific papers find this of much use. LaTex editors allow users to format the text before hand with the help of markup level instructions and after the content has been inserted, the document will be PDF read (Or any other format). The very reason why these editors came into being was for the use of mathematical equations. Lyx is one of the best free LaTex editor available on cross platform for generating documents. The user interface is really simple and easily usable, also mathematical equations can be rendered quite flexibly, (Images, tables) etc. A LaTex document can be created quite simply without the need of being worried about LaTex codes. The editor has made it easy to create documents and working on this has never been easier. 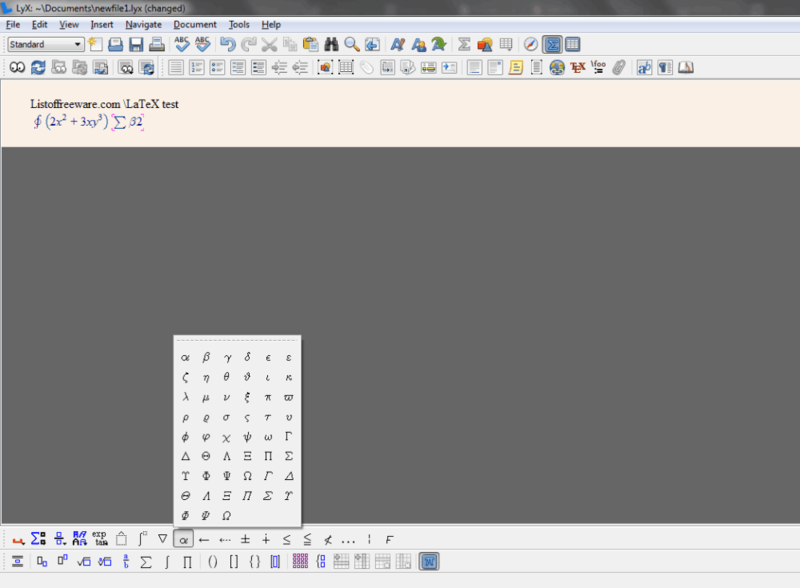 TeXmaker is another multi-platform solution for editing LaTex document. The tool can be used on both Mac and Windows devices and has innumerable number of features. To begin with, the TeXmaker has a very basic and simple set up. With the help of this, you users can as well run a quick spell check and have access to a range of other features through the ‘Quick start’ option. The ‘Structure view’ option also lets users to streamline the documents under separate sections. Inserting tables and formulas, other references are pretty straight. After having completed your layout, the document can very well be extracted as an HTML, ODF, etc. Another prime feature of this tool is to be able to effectively eliminate errors by detecting them defectively and changing accordingly. All the errors displayed will allow you to make according changes. The tool also allows users to create Bibliography section for the document as well. Short cuts for TeXmaker are many and the tool is as a whole a great one for all your needs. The tool is available for all the platforms including Windows, Mac OS X as well as Linux. TeXstudio is one of the best LaTex editor for Windows as well as your Mac devices. This has been one of the most popular tools among users and is an extension of previously stated editor, TeXmaker. Though the entire look and feel is quite similar to what TeXmaker has to offer but in additional to the features there is also space for other options such as word count, number of times a word appeared, etc. So, basically the TeXstudio is a complete tool in its own despite being an extension. Some of the best features of the editor include multi cursors, highlighting, checking as per references, 1000 plus math formulas, etc. Also, in additional to the above stated features, the TeXstudio also allows for link overlay, a feature that coverts texts into links. The assistant feature of the editing tool allows anyone to use this latex editor and help them in setting up files, etc. Working with images in this editor is quite handy. There are a range of features which make the TexStudio editor a handy and simply to use app are many; including auto corrections, syntax highlighting, code folding, etc. ShareLaTex is yet another great editor which allows you to work with LaTex document editing online and lets you edit them from the browser itself. One of the best features for this editor is the availability of 400 templates that come along with it itself. The templates include a score of things to choose from, including technical paper layouts, CV layouts, magazine articles, etc. Also, it lets you choose layout options that will make editing content easier and you will not have to worry about the formatting options. The ShareLaTex has been listed as one of the best LaTex editor tool for Mac due to the additional features and its simple user interface! WinShell has an integrated environment for developing with documents in both TeX and LaTex. This again is a cross platform editor available on both Mac and Windows and is one of the best LaTex editor. The key features include highlighting, spell checks, coding without errors, working with mathematical tools, etc. The tool is easy to use and given the kind of features it has in store, this is a favorite of many. You can as well have a PDF preview of the document but it doesn’t has an PDF viewer integrated in itself. And that was all about the LaTex editors available and which are the best ones available for free on your Mac and Windows devices. The cross platform editors available are pretty much a good choice; depending upon the kind of features that you need generally for working with documents, you can choose the tool which best suits your needs!